How did you become an advocate? 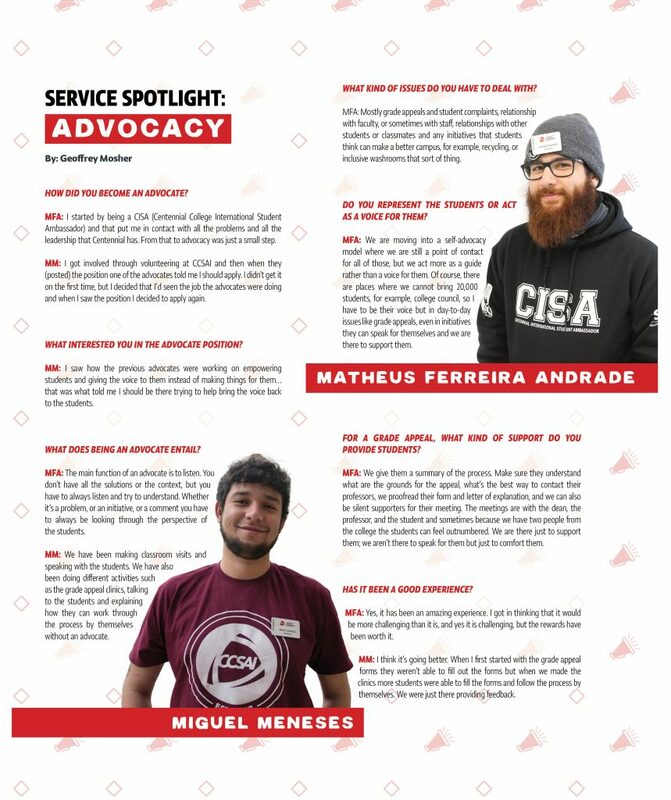 MFA: I started by being a CISA (Centennial College International Student Ambassador) and that put me in contact with all the problems and all the leadership that Centennial has. From that to advocacy was just a small step. MM: I got involved through volunteering at CCSAI and then when they (posted) the position one of the advocates told me I should apply. I didn’t get it on the first time, but I decided that I’d seen the job the advocates were doing and when I saw the position I decided to apply again. What interested you in the advocate position? What does being an advocate entail? MM: We have been making classroom visits and speaking with the students. We have also been doing different activities such as the grade appeal clinics, talking to the students and explaining how they can work through the process by themselves without an advocate. What kind of issues do you have to deal with? MFA: Mostly grade appeals and student complaints, relationship with faculty, or sometimes with staff, relationships with other students or classmates and any initiatives that students think can make a better campus, for example, recycling, or inclusive washrooms that sort of thing. as a voice for them? MFA: We are moving into a self-advocacy model where we are still a point of contact for all of those, but we act more as a guide rather than a voice for them. Of course, there are places where we cannot bring 20,000 students, for example, college council, so I have to be their voice but in day-to-day issues like grade appeals, even in initiatives they can speak for themselves and we are there to support them. MFA: We give them a summary of the process. Make sure they understand what are the grounds for the appeal, what’s the best way to contact their professors, we proofread their form and letter of explanation, and we can also be silent supporters for their meeting. The meetings are with the dean, the professor, and the student and sometimes because we have two people from the college the students can feel outnumbered. We are there just to support them; we aren’t there to speak for them but just to comfort them. Has it been a good experience? MFA: Yes, it has been an amazing experience. I got in thinking that it would be more challenging than it is, and yes it is challenging, but the rewards have been worth it. MM: I think it’s going better. When I first started with the grade appeal forms they weren’t able to fill out the forms but when we made the clinics more students were able to fill the forms and follow the process by themselves. We were just there providing feedback. MFA: I would like for the students to see all board members as advocates for them. As that support to give them their voice back, that’s what self-advocacy means. Even if we don’t have a position that is specifically “advocate” I would like them to know that we are all advocates. MFA: I see a lot of initiatives that have been brought to the college have gained their own life and these students lead that. So not only are they able to speak for themselves when there are issues, but they are also able to speak for themselves when they want to change something. That’s great for us; because once they graduate they have their voice. MM: We have been working to make our take our advocate services online. We are working right now so that students can use the form online and through that service we provide them with our feedback. MFA: Another reminder that if these students want something, if they feel like they are not being heard or if they just want to see what we do, just got to an office, grab a card and get in contact with us. Our job is to listen to you. 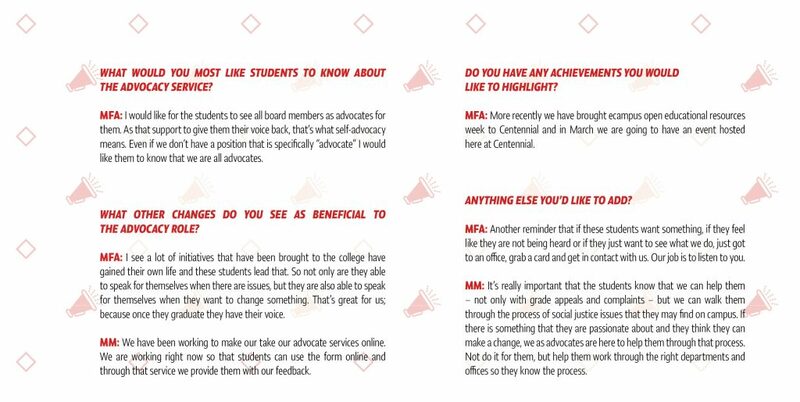 MM: It’s really important that the students know that we can help them – not only with grade appeals and complaints – but we can walk them through the process of social justice issues that they may find on campus. If there is something that they are passionate about and they think they can make a change, we as advocates are here to help them through that process. Not do it for them, but help them work through the right departments and offices so they know the process.